Who are you? When you start to explore this question, you find out how elusive it really is. Are you a physical body? A collection of experiences and memories? A partner to relationships? Each time you consider these aspects of yourself, you realize that there is much more to you than any of these can define. 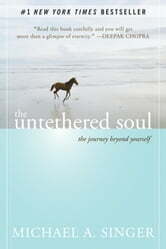 In The Untethered Soul--now a New York Times bestseller--spiritual teacher Michael Singer explores the question of who we are and arrives at the conclusion that our identity is to be found in our consciousness, the fact of our ability to observe ourselves, and the world around us. By tapping into traditions of meditation and mindfulness, Singer shows how the development of consciousness can enable us all to dwell in the present moment and let go of painful thoughts and memories that keep us from achieving happiness and self-realization. Truly life changing. Forever grateful I read it and I will read it again. I have finally been able to find peace. Some books I label; "Read Often," this is such a book. I have read it several times, without fail, every read has brought me new insight. I recently got out of a relationship because I had too many negative feelings, like jealousy and anxiety. I bought this book soon after. I believe this book has changed a lot about me. Since reading the first chapter, I instantly felt more free. I literally feel my heart changing, and I'm so much more happier and willing to experience life moment to moment. The only thing I was not expecting is the last chapter. It speaks about God. I'm not a religious person, and up until that point I did not see this book going in that direction. I don't mind, it's still nice to see the relation to religion. This book saved me. This is a book with perspective you read time and again. When going through different trials there is a chapter to help bring you back on track in a practicable user friendly way, every book shelf deserves one. This was a pretty good read. Chapters 1-9 didn't provide anything that enlightening but I thoroughly enjoyed chapters 10-19.